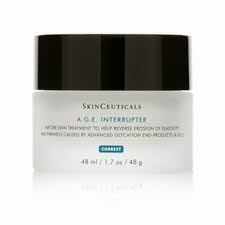 to help prevent the glycation process and correct severe signs of intrinsic aging in mature skin. Blueberry extract is both an antioxidant and anti-glycation ingredient that inhibits advanced glycation end-products (A.G.E.) while preventing further oxidation from occurring. ProxylaneTM rebuilds the support structure that degrades as a direct result of intrinsic aging and efficiently improves anchorage of the skin’s upper layers onto the dermis to increase elasticity and thickness. Phytosphingosine protects the skin’s barrier, while rich emollients hydrate dry, cracking skin. This multi-faceted and uniquely-textured formulation is optimized to prevent and correct the most visible signs of aging, while minimizing the associated discomfort and dryness. While glucose is a vital cellular fuel, as we age and our metabolism slows, glycation causes excess glucose molecules to stick to collagen and elastin, leading to cross-linked fibers. This cross-linking forms chemical bridges between these proteins that result in advanced glycation end-products (A.G.E.). Glycated fibers become rigid, less elastic, and have reduced regenerative ability, which leads to damage such as laxity, cracking, and thinning skin. Another major contributor of intrinsic skin aging is the flattening of the dermal epidermal junction (D.E.J.). In young skin, the D.E.J. has the appearance of a mountain range that helps anchor the epidermis to the dermis, forming a network of supportive collagen fibers. As skin ages, fibers in the D.E.J., primarily responsible for the appearance and texture of skin, glycate. In addition glycosaminoglycans (GAGs), the essential molecules responsible for holding water, nutrients and modulating the extra- cellular space in the D.E.J., break down. Both glycation and GAG depletion lead to the degradation of the extra-cellular matrix and the flattening of the D.E.J., resulting in sagging, creping, and severely wrinkled skin. Massage a thin, even veil into the entire face, neck, and chest once or twice daily.